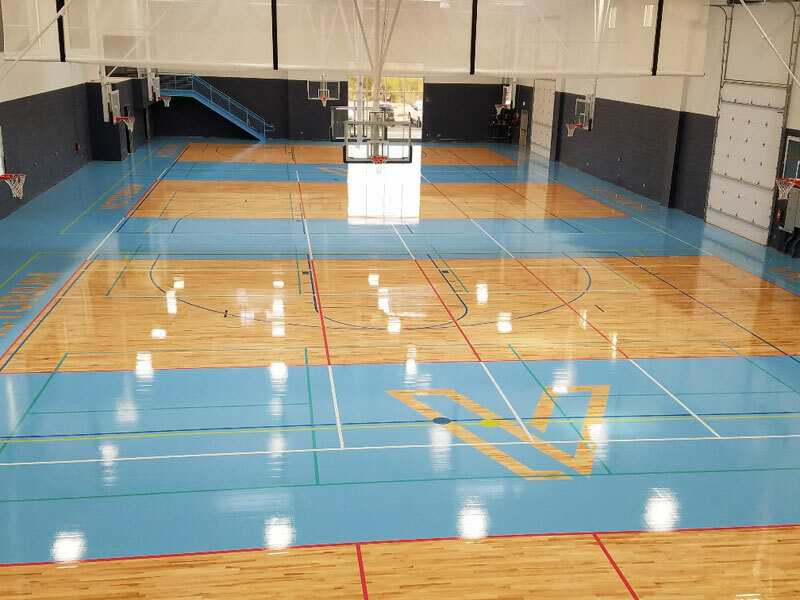 In January of 2016, LGE Design/Build contacted us to help specify and build a sports wood flooring system that would work for a new field house that was being built in North Scottsdale. This is a brand new building that broke ground at the end of spring in 2016 with a fast track schedule to have ready for January 2017 Grand Opening. The facility has over 25,000 square feet of actual floor space with 18,000 square feet dedicated to indoor sporting activities. The facility is specifically designed and built to house club volleyball teams, but they can also support basketball, pickleball, and Futsal. The floating sports floor system is an Action Thrust I which is configured with natural rubber pads, 2 layers of sheathing and 25/32” x 2 ¼” #2 MFMA Maple. We delivered the Maple flooring and all the subfloor components on Friday, December 9th, 2016. We got to work immediately on assembling wood flooring system and allowing the maple to start acclimating. Being that we were so close to the Christmas holiday and the end of December, January 2017 was the grand opening date and time was not on our side. With the team understanding the critical path that lied ahead everyone was on board to make sure we were able to complete the project on time with no delays on our part. The commercial crew worked long hours and weekends to get the subfloor and maple flooring installed by the 23rd of December. By doing this we would be ready to start sanding on the 26th (the day after Christmas). Needless to say, our team pulled through, and the sanders were on the floor that Monday the 26th. By the end of the week, we had our first coat of sealer applied and ready for the second coat to go on Saturday. The team came in on Sunday to prep the floor, start lining out for all the intricate courtliness and they were painting on Tuesday. The paint takes about 48 hours to cure so they did everything they could to get as much work done as possible to allow for the paint to cure properly. By Friday we were applying our one coat of finish and Saturday was our final coat. The only thing we had left to install was the Vent cove base at the perimeter, thresholds at all the transitions and volleyball standards to hold the volleyball sleeves. On Tuesday, January 10th, 2017 we turned the floor over to the contractor and owner. We completed the floor two weeks ahead of schedule to make sure they were ready for their 1st practice and GRAND OPENING on the 30th of January. Even though the project had a tight schedule and challenging striping plan the team enjoyed the project and was proud of what they had done in just a short amount of time. The facility is Victorium Sports Complex located in Scottsdale, AZ. Check out the different stages of construction below.